Moses Kwaku Oppong, the leader of Kakaiku’s Guitar Band, was born on 2nd October, 1916 at Aboso in the Western Region. “Kak-Ku” became his nickname at school. Around 1934, Kwaku was very good on the guitar and was playing at parties, wake-keepings and funeral obsequies. He founded the “Kakaiku’s Band on August 1, 1954, giving the band his boyhood nickname. That same year, they made their first recording with the United Africa Company. Kakaiku’s Guitar Band has to its credit over five hundred records in Fanti, Hausa, Ewe, Nzima and English on 78, 45 and 33 rpm records. 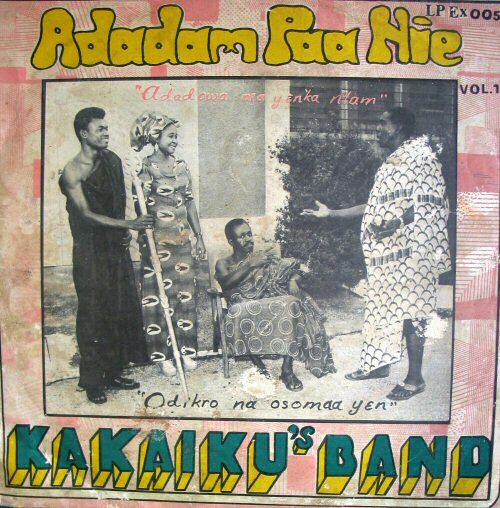 The musician, actor and band leader, Kakaiku, founded a concert party that performed together with his highlife band in 1954. Kakaiku introduced plays that had a tremendous variety of characters and dramatized complex situations and themes. Audiences loved Kakaiku’s concert parties because they depicted what was actually happening in people’s everyday lives, in their homes and families. Kakaiku revolutionized both the form and content of concert party shows by expanding the troupes, diversifying the themes, and unifying theme, music, and story. Source: C.M. Cole, 2001, pp.144-145.